Before the seats were warm for this mid-summer classic at Great American Ballpark, the Silver League All-Stars had scored the eventual winning runs and they would never look back as they piled up 23 hits on the night. 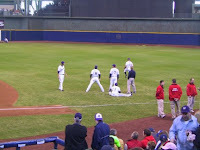 The unraveling for the Gold League began immediately as Fausto Carmona mishandled a Brian Roberts comebacker to lead off the game. After a Grady Sizemore single, Chipper Jones began his big night by delivering two RBI’s with his double before an out could be recorded. Before the 1st inning was over, Jones crossed the plate on a single from hometown slugger Adam Dunn and the Silver League was off to a fast 3-0 lead after ½ an inning. Carmona came out of the home dugout to pitch the 2nd, but was greeted rudely once again with singles from shortstop Carlos Guillen & Brian Roberts, a walk to Sizemore and a 2-RBI single to Chipper Jones. That was all she wrote from Carmona as he was replaced by Dan Haren with nobody out. For the 2nd consecutive inning, Adam Dunn finished off the scoring by singling in a run. The Silver League lefty starter, Rich Hill, held up his end nicely by retiring the side in order in the 1st while giving up only 1 earned run, 2 hits, 1 walk, while striking out 4 Gold batters in 3 innings of work. Rich Hill left after 3 innings with a 6-1 lead in a game that was never close. After Hill left the game, the rest of the Silver League staff handled the Gold top vote getters with little more than a whimper as Derek Lowe, Johan Santana, Barry Zito, A.J. Burnett, Justin Verlander, Eric Bedard, Houston Street, Matt Capps, & Joakim Soria all combined for 6 Innings of shutout pitching while giving up only 5 hits and striking out 6. The story of the game though was the Silver offense. Alex Rodriguez hit the first of his 2 homeruns in the 4th with a solo blast and the fireworks really hit their peak in the top of the 5th. With 2-out and Victor Martinez at 2nd base, Brendan Harris came in to pinch run. Grady Sizemore doubled him in off Gold pitcher Sean Marshall and next, Chipper Jones connected with a 2-run bomb giving him his 6th RBI of the game! Then, Carlos Pena homered and after Bobby Jenks came in from the pen, A-Rod crushed a solo blast completing back-to-back-to-back HR’s for the Silver League squad giving them a 12-1 lead. Albert Pujols would also connect with a pinch-hit HR in the 6th & Adam Dunn would satisfy the hometown crowd with a homerun of his own in the top of the 9th. In total, the Silver League out homered the Gold League all-stars 6-0, out hit them 23-7, and hit for 47 total bases with 11 extra-base hits compared to the Gold’s 9 total bases! The top of the Silver order got the job done as Roberts, Sizemore, & Orlando Hudson combined for 7 Runs, 6 Hits, 4 Extra Base Hits, & 2 Walks in the #1 & #2 holes. Chipper Jones feasted on all the base runners by going 3 for 4 with a single, a double, & a home run with 6 RBI’s while earning player of the game honors. Alex Rodriguez was the only player to hit multiple home runs with 2 solo shots going 2 for 5 with a walk. Adam Dunn finished up going 3 for 5 with a walk and had 3 RBI’s. Coming off the bench, Orlando Hudson made the most of his plate appearances going 2 for 3 with a triple and a double after entering the game for Brian Roberts in the 6th inning. Every Silver League All-Star with a plate appearance managed at least 1-hit except for Brendan Harris who was 0-1 with 1-run, Kenny Lofton who was 0-1, & Russell Martin who was 0-2 with 2 K’s. No Gold League All-Stars gathered more than 1-hit and David Wright mustered up the only RBI in the 3rd with a 2-out double off Silver League starter Rich Hill. Brandon Phillips had the only other extra base hit for the Gold team when he pinch hit for unanimous vote getter, Chase Utley in the 8th. I would first like to thank all of the BRASS League owners for giving a newbie like me a chance to host the 2089 BRASS All-Star Game. I really had a great time with it as I spent some time mulling over how to manage the rosters and get everyone into the game. As I began setting the lineups, I had a strong feeling that this game was going to fall the Silver League’s way. My first observation was that the Gold League starting lineup was loaded with five lefty bats against the Silver League’s southpaw starter, Rich Hill. In contrast, Gold’s starter, Fausto Carmona, was sent to the mound to face a lineup stacked with four switch hitters and would only face two righties, A-Rod and Vladimir Guerrero, on his first trip through the lineup. This opening matchup could not have turned up much better for the Silver squad as they capitalized. Rich Hill cruised through the starting lineup over the opening three innings as Carmona got shelled giving up six runs in 1+ innings and couldn’t record an out in the 2nd before giving the ball to the pen. The bullpen also seemed to tilt the Silver team’s way. The Gold team was equipped with only one left handed pitcher on the whole roster, Sean Marshall. Unfortunately for him, he had an infinite ERA after pitching in this game. He surrendered a double to Grady Sizemore, a two-run homerun to Chipper Jones, and a homerun to Carlos Pena in the 5th without recording a single out. Conversely, the Silver team had a great mix of lefty / righty & reverse righties to throw at the Gold lineup as the situation dictated, giving the Silver team advantages all game long. From a managing standpoint, I really tried to give guys more or less playing time based on the voting. I think my biggest decision came in the 6th inning when Albert Pujols pinched hit for Chipper Jones who had already gone 3 for 4 with a single, double, a homerun, and 6 RBI’s! As it turned out, Pujols got his pitch off Pat Neshek and clubbed it into the pavilion for a 2-run homer. Looking back based on the dice roll, Chipper would have also crushed a homerun and would have ended the day 4 for 5 with two 2-run homers and 8 RBI’s. I feel a little bad that I pulled him, but based on the votes I felt I should get Pujols in the game. I debated on leaving Jones in the game and pulling Carlos Pena for Pujols, but again I decided I should leave in Pena as he was the top vote getter at his position. Unfortunately, Pena was disappointing going 1 for 6 with a solo HR and 2 K’s. Being that this game was being played at power-hitter friendly, Great American Ballpark, I expected to see some home runs. We were not disappointed as the Silver team hit 6 homeruns on 23 hits. What was surprising was that none of the homeruns were cheapened by the ballparks favorable weather settings as these homeruns would have cleared the fence on even a bad day at this ballpark. The split deck was not required on three of the bombs and the split deck came up 7, 2, & 4 on the other 3 deep blasts. What was surprising was the total hits piled up since singles are usually tough to come by at Great American. In closing, I think it should be noted that the Strat-O-Matic game gave Joakim Soria the win. As an official scorer, I don’t believe that is the right judgment as he entered the game with a 16-1 lead. I believe that Rich Hill’s 3-inning performance of rolling thru the starting lineup warrants him the win. If official baseball rules don’t allow for a starter to earn a win without 5 Innings under his belt, then I think Derek Lowe or Johan Santana should get the credit. Lowe pitched a quick 4th inning with a 7-1 lead giving up a single but earned a strikeout and a double play groundout. Santana came into the game in the 5th with a 12-1 lead and gave up a single while striking out two batters. I hope you all enjoy the box score & recap as much as I did playing the game. The matchup produced exciting moments like the 3 consecutive HR’s in the 5th inning, Chipper’s 6-RBI MVP performance, Grady Sizemore rounding the bases and scoring 4 times on the day, Adam Dunn treating the home town crowd with 3 hits & 3 RBI’s including a home run, and also Rich Hill’s stellar start striking out 4 Gold All-Stars in 3 innings. Congrats to the Silver League All-Stars, a very balanced and powerful team. The Sierra Nevada Goldens concluded the 1st half of the season a frustrated bunch. After opening their inaugural season with two winning months going (32-24), the Goldens sputtered in June going (13-15) versus the Platinum division, fininshing the first half with a (45-39) record. The month of June started with Sierra Nevada trailing the Duluth-Superior Dukes by only 2 games in the Silver League's Copper Division. The Goldens sputtered out of the gate losing 5 of 7 to the struggling Sugar Creek Settlers. In a thrilling series, the Settlers managed to pull out 3 wins in extra innings & squeaked out another one-run victory by a score of 4-3. The 5th Settlers win of the series was a game where Beckett gave up 10 runs, 5 earned, in 4 2/3 innings. The Goldens responded from adversity with an outstanding (5-2) series win against the league leading Diamond Gems. In the 1st ever netplay series for the Goldens, the hitters swung mighty bats as the Gems were handed their 1st series loss of the season. Sierra Nevada outscored the Gems 55-37 in the 7 games and the 2 losses were by a combined 3 runs. In the series, Beckett got a win while Buehrle earned a win and a no-decision which led to a win. The two have turned out to be dominant at times giving the Goldens a formidable 1, 2 punch. The story of the series were the bats. The Goldens seemed to hit clutch home runs the entire series and Jim Thome crushed a homer in each of the 1st 4 games. This series was by far the highlight of the month. Sierra Nevada finished up the June schedule going only (6-8) in the remaining 14 games as Twin City pummeled them in 6 of the 7 contests and the Goldens took 5 of 7 versus the cellar dwelling Andover Cougars. The month of June was all in all a big disappointment. You can point to poor fielding from Miles at shortstop while Renteria rested. Or, maybe the lineup missed Hank Blalock from the left side as he missed the month due to injury. More than anything, you need to point to the starting pitching. Mark Buehrle was the most effective going (2-1) in 5 starts with a 4.76 ERA, but Josh Beckett was (1-3) in 5 June starts, with a 6.82 ERA! Aaron Harang LOWERED his ERA this month by going (1-1) in 5 starts with a 5.40 ERA......not good for a #3 starter. Gil Meche went (2-3) in 6 June starts with a 6.02 ERA, including only going 1 1/3 giving up 5 in a loss at Andover. Sierra Nevada is banking on Buehrle, Beckett, Harang, and Gil Meche to bounce back and pitch more as expected as they enter the 2nd half of the season and league play begins. The Goldens made a trade in hopes that they could improve their (11-12) record versus lefty starters. Carlos Beltran & Conor Jackson were acquired from the East Lyme Crush to add a stronger presence from the right side of the plate & speed and center field defense with Beltran. While Sierra Nevada was sorry to say goodbye to Marlon Byrd, Skip Schumaker, Mike Jacobs, & Yusmeiro Petit in the deal, the Goldens are hoping that these two additions in the middle & top of the lineup will help the Goldens make up ground on the Copper Division leading Duluth-Superior Dukes who sit 4 games ahead of Sierra Nevada. The Goldens also trail the San Jose Scorpions by 4 games for the final Silver League Wild Card spot. The month of December will feature head-to-head games with San Jose, one of the two teams ahead of them in the wild card standings, and with East Lyme, Beltran's old team. After making it to the LCS last year, the Chuckanut Bay Tubas saw most of their players depart in free agency and are in rebuilding mode. This year has been rough, as the current record is 21-56. The team is scoring 4.2 runs per game, but giving up a whopping 7.3 runs per game. Obviously this season is a lost cause, but what holds for next year and the future? 2009-2010 pitchers under contract: Dellin Betances (amateur), Billy Buckner, Kelvin Jimenez, Josh Kinney, Mark Lowe, Brandon Lyon, Franklin Morales, Juan Morillo, Felipe Paulino, Mark Prior, Max Scherzer, Levale Speigner, Brian Stokes. This is looking pretty brutal. The only full cards are Lowe, Lyon, Scherzer and Stokes in relief. Chuckanut Bay will need to find a complete rotation through the draft and free agency. 2009-2010 batters under contract: Billy Butler, Miguel Cabrera, Hank Conger (amateur), Johnny Damon, Johnny Estrada, Andy Gonzalez, Adam LaRoche, Jed Lowrie, Julio Lugo, Brandon Moss, Steven Pearce, Tony Pena Jr., Wily Mo Pena, Felix Pie, Justin Ruggiano, Seth Smith, Taylor Teagarden, Preston Wilson. Catcher, second base and outfield are severely lacking in at-bats. The bloated contract of Julio Lugo is stuck on the books through the 2010-2011 season. Basically the team has no good bats for 2009-2010 other than Miggy Cabrera, Damon and Adam LaRoche. Obviously 2009-2010 is going to be another lost season. There are simply too many holes to be plugged up, so it will be another year of drafting young talent and plugging holes with temporary solutions via SFA. Management is looking to trade Johnny Damon for a prospect or two and would be open to moving Miguel Cabrera for a big haul if someone is interested. What does the future look like for the Tubas? A lot of it depends on how some of the younger players pan out. On the pitching side there are still some good prospects in Betances, Buckner, Morales, Paulino and Scherzer. On the hitting side there is Butler, Cabrera, Conger, Lowrie and Teagarden. If Brandon Moss, Wily Mo Pena, Felix Pie and/or Seth Smith pan out, the offense suddenly looks a lot better. The Tubas will continue to amass young talent and hope that perhaps the team can start competing in 2010-2011, but 2011-2012 is probably a more realistic option. I didn't realize we had this blog to make posts on until the other day. Thanks for inviting me to join in. After the 2nd game of the season, I wrote this short article but never emailed it out. Feel free to enjoy the box score posted on the BRASS site. In the 2nd game of a 4-Game Set, Dan Haren squared off in an early-season matchup vs Mark Buehrle and dominated the Sierra Nevada Goldens and tossed a No-Hitter in front of 19,811 at Great American Ballpark @ Sierra Nevada!!! The game was never in question as the Hitmen jumped out to a 4-0 lead by the end of the 3rd inning following a big 3-run homer by Magglio Ordonez. Haren was dominant throughout the game and tallied 11 strikeouts, including Dan Uggla three times and also struck out the side in the 5th. Only three batters reached base for the Goldens by way of walk. Only Yadier Molina came close to getting a hit. He just missed getting a line drive single to left in the 6th, and was robbed of a home run with 1-out in the 8th inning which was held in the park only by the cold weather here at Great American Ballpark here in the early spring. Buehrle pitched a strong 7 1/3 giving up only 4 hits but Haren was the story today as the Plainsfield Hitmen won their 2nd game in as many nights against the Sierra Nevada Goldens to start the season. Bengie Molina of the Goldens left the game in the 3rd inning due to injury. Edgar Renteria of the Goldens left the game in the 9th inning due to injury. Tomorrow’s game features Matt Cain for the Hitmen against Josh Beckett of the Goldens. This season really has been tough to call in terms of buying, selling, rebuilding, retooling, etc. We have a very solid nucleus of hitters, a good D, a nice bullpen, and decent but not great starting pitching. After a very slow April, May was a bit kinder to leave us at 29-27 heading into June play. The biggest stat that jumps out at me is our 3-11 record in 1-run games. Sabermetricians generally ascribe bad 1-run records to luck, and say this tends to even out over the course of a season. If so, we could expect to end up with something like 85-90 wins and a good shot at the playoffs, despite a very competitive division. At the same time, the odds of advancing if we do make the playoffs would not seem to be high. Plainsfield & Diamond have dominant teams, and Cream City, Green Bay, and Montreal show the potential to separate themselves from the pack as well. Of course upsets will happen, but the deck seems a little stacked against us. We made 2 small deals, essentially swapping Gotay for Harris and downgrading from a 3rd to a 5th pick in the process, but saving a bit of cash. Gotay was lights out as a PH for us so hoping Harris can do that job and help with PR/OF defensive sub duties also. In terms of offense, Pena, Rollins & Doumit are carrying us. Doumit's 17 doubles & 19 RBIs in 100 ABs look very nice but are unlikely to continue. Pena has 26 HRs with about 40% of his PAs used, still looking good for him even if we slow him down in June a bit. Rollins is putting up a nice BA as expected, and the pop has been there, which may warrant moving him up to 4th in the lineup rather than 6th, where he is currently vs RH. The much-maligned Barry Zito has been the staff ace to date, putting up a 7-2 record and a solid 3.12 ERA over his 1st 90 IP. All our other SPs have been average at best, though the bullpen has managed a very nice 3.53 ERA in 112 IP so far. In sum, we have a team that's built for the regular season which is unlikely to stop the best offenses come playoff time, so in general I'd still characterize us as sellers for this year. So on that note, send offers if interested! On a gorgeous summer day, seven members of the BRASS League got together at the Rock residence in Brookfield to enjoy conversation, refreshment, sustenance, and whiffleball (Above shown [l-r] Tony Cieszynski, Abby Rock and Bob Gale). 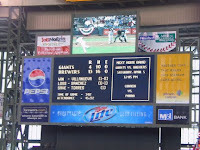 And then after all was done, the happy owners drove to Miller Park and watched the Milwaukee Brewers come from behind to defeat the Houston Astros 6-4 and claim a share of first place in the National League Central division. A fine conclusion to a glorious day, and the only victory on a lost home stand. 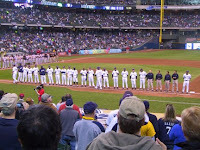 I think the Brewers should consider having BRASS League members attend all home games in the future. Heck, put us out on the road, too. The Breweres will win their division by 30 games. Above photo: [l-r] Vaughn Nuest, Mark Lentz, Daniel Valois, Tony Cieszynski and Bob Gale. Anyway, here are a few action pictures of the good-looking guys who got together. There is talk of doing this next year in Milwaukee and on a regular basis thereafter. More news on that front later. Above photo: BRASS members raiding the Rock refrigerator. Vaughn Nuest shows off the batting style that won three batting titles in tee-ball. Tony Cieszynski reacts to a brushback pitch. Juust a bit inside. At the game. In the back row: [l-r] Kevin Kolb (who joined us late at the game) Mark Lentz, Tim Rock, Bob Gale. Front row: Tony Cieszynski, Daniel Valois, Vaughn Nuest. It is an immigrant story really. In the late 19th Century, my great grandfather left the Alsace-Lorraine region of Germany with his family for the prospect of a better life in America. Gustave Bucher worked the land in Germany as a farm laborer and this was all he knew. But he dreamed of more. He dreamed of owning his own farm one day and a better life for his family. So he came to America. He and his family settled in a small town in central Illinois whose rich earth reminded him of home. My grandmother was born there within the first year and was the first generation of my family to be an American citizen. The brass bucket that we use for a trophy is also from the 19th Century. It is a farm vessel that is very like a bucket that my grandmother used to keep in her garage as a keepsake of the time of her youth. Like most farm vessels, hers was not ornamental as it had been constantly in use serving a multitude of needs. My grandmother said they used their bucket to haul water from the well, to take the table scraps out to the hogs to eat, to gather and tote feed corn for the chickens and bring back the eggs they had laid, even to wash dishes, babies and soak their feet. Her bucket was well-worn and was a symbol of the story of her family's immigration and of the roots they put down in midwestern American soil. Our bucket, hand made as hers was, is more ornamental and ceremonial in nature. Like my family, the BRASS League has midwestern American roots and our bucket, a symbol of those roots, is a traveling trophy which resides in the league champion's home for the year of their reign. 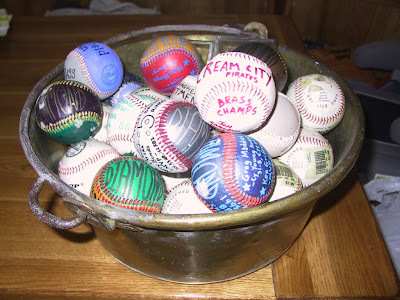 Our bucket is filled with baseballs. 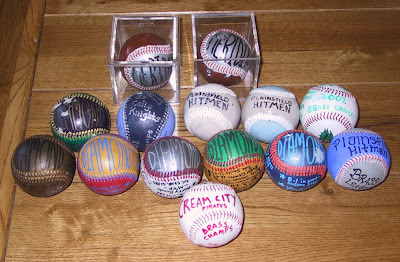 Each league champion takes one of the baseballs and paints it or decorates it as they wish and places it on the heap, displaying it in their home and commemorating their championship, before conveying it to the next champion. The Bucket is formally called the Thomas Taormina Trophy in honor of Tom's profound contributions to the formative years of BRASS, before his untimely passing. What a neat coincidence that The Bucket will be in the same place as the BRASS gathering in southern Wisconsin, not too many miles from where my great-grandfather settled in the late 19th Century, starting a cycle of events that would eventually lead to me and to the BRASS League. I'm sure Tim will have it polished and gleaming for all to see in July, as he hands it over to Kevin, this year's champ, a man who will be taking The Bucket back home with him for a fourth time. One of the rule changes you voted in (I won't say "we"; I voted against it) requires that players who previously had major league deals must be signed to a U contract if drafted. The rationale, if I recall, was to avoid underpaying players with previous major-league experience. Has anyone else noticed that the result was to swing the pendulum the other way? A lot of players in the draft pool will, if picked, be paid more than they would if their original teams had kept them. Take Ben Zobrist, for example. He was a Y1 last year, and if I'd kept him on my roster he'd be Y1 again because he didn't get enough PAs to advance. Since I cut him, he's in the pool, and must be signed to a U contract if drafted. That would pay him, at a minimum, three times what he'd have made as a Y1. But of course he won't be drafted, because no one's going to pay Ben Zobrist $1.2M to play for them next year. Ironically, the same will be true for nearly every "U" player in the draft pool; they're there in the first place because one or more teams had the chance to pay them a Y or A1 salary and chose not to. I haven't looked through the list to see if there are exceptions, but I'd be very surprised if there are more than a couple. The result of this will be a larger number of PAs and IPs in the secondary free agent pool, where teams will finally have the chance to get the marginal "U" players for what they're worth. This might be a good thing; did anyone vote for the change because he foresaw that and liked the idea? Both teams headed into the series with a full head of steam. The Sunsets had just stormed back from a 3-1 deficit against Dulth-Superior, while the Hitmen had dispatched Chuckanut Bay in four straight. One question: would the extra time off earned after the 4-game sweep hurt Plainsfield? And would the Sunset bats remain hot? Looked that way early on in Game 1. After the Hitmen had taken an early 2-1 lead thanks to a 2-run single by Matt Holliday, the Sunsets exploded against Mussina for 5 runs in the 3rd, sending the Plainsfield starter to the showers early. JD Drew had the big hit, a 2-RBI double. Leading 6-3 after 3 innings, John Smoltz made the lead stand up. The Sunsets tacked on runs in the 4th, 7th, and 9th en route to a 10-5 win. JD Drew was the star of this game, going 5 for 5 while hitting for the cycle. Travis Hafner had two hits, including a homer, while John Smoltz pitched into the 7th against the powerhouse lineup of Plainsfield. The Sunsets weren’t satisfied with just one win in Plainsfield. They were looking to grab the series by the neck. Hitmen fans weren’t even in their seats before Montreal leadoff man Bobby Abreu took Harang deep for a quick 1-0 lead. The Sunsets loaded the bases with nobody out, but Harang managed to escape with only one more run scoring. An RBI single by Holliday in the bottom of the 1st made it 2-1 Montreal. Griffey Jr. homered in the 2nd to tie it, but Montreal came right back with 2 of their own in the 3rd, thanks in large part to FOUR Harang walks. Chris Coste (3 for 4, 3 RBIs) added a 2-run double in the 4th, and the Sunsets had a 6-2 lead through four innings. They would not score again, but thanks to three perfect innings from their bullpen, they didn’t have to. Final score, Sunsets 6, Hitmen 4. Montreal heads home with a surprising two games to none lead in the series. Likely the biggest game of the season for Plainsfield, but Montreal was very uncooperative. The Sunsets torched Arroyo, scoring two in the first and five more in the second, thanks in part to 2-run homers by Bobby Abreu and Travis Hafner (4RBI). Trailing 7-0 after 2 innings, the Hitmen were very much on the ropes. Signs of life appeared in the 4th, as the Hitmen put a 4 spot up. An unlikely error by Ryan Zimmerman helped set the table, and Ken Griffey laced a big 2-run 2-out double to help cut the Montreal lead to 7-4. Montreal came right back with a run in their half of the 4th, and the Hitmen trailed by 4. Myers settled down a bit after the 4th, yielding only a solo homer by Matt Holliday in the 6th. Through 7 innings, the Sunsets were up 8-5. In the top of the 8th David Wright led off with a double, sending Myers to the showers. In came Carlos Zambrano, winner of 18 games during the regular season. The bullpen did not agree with Big-Z, as all three hitters he faced reached base. With the bases loaded and nobody out, Hector Carrasco was summoned from the pen. Adam LaRoche greeted him with a big 2-run double to tie the game at 8, and then Jorge Posada launched a huge 3-run homer, to make it 11-8 Hitmen. Drew and Zimmerman singled off Papelbon in the bottom of the 9th, but the Hitmen closer retired the next three batters and secured the 11-8 win. The Hitmen were once again alive, trailing two games to one. The Hitmen took the momentum from their dramatic Game 3 victory and jumped to a quick 4-0 lead after 2 ½ innings, thanks to a 2-run homer for Matt Holliday and RBI hits for David Wright and Jermaine Dye. JD Drew answered in the bottom of the 3rd with a 2-run double to make it 4-2. Each team added a two-spot in the 4th, and the score stood at 6-4 after 4 innings. A JD Drew homer in the 6th made it 6-5, which is how the game stood through 8 innings. Bob Wickman started the 9th after hurling a scoreless 8th, as Jonathan Papelbon had pitched in each of the first 3 games. A pinch hit double by Chris Coste and a walk to Kevin Youkilis forced the hand of the Hitmen, and Papelbon was brought in to hold the one run lead. Bobby Abreu promptly tied the game with an RBI double, and with nobody out, runners stood at 2nd and 3rd. After getting Chipper Jones to pop out and Travis Hafner on strikes, Papelbon and the Hitmen were one hitter away from extra innings with David DeJesus at the plate. DeJesus never had a chance to win it, as Papelbon uncorked a wild pitch to score the winning run for Montral. A heartbreaking loss for the Hitmen, and the Sunset were one victory away from their first BRASS title. The Hitmen, with their backs squarely up against the wall, jumped on Santana early with twin 2-run homers by Jermaine Dye and Rich Aurilia. The lead was cut to 4-2 in the bottom of the 4th on a Travis Hafner triple and a JD Drew RBI double. Hafner homered in the 6th to cut the Hitmen lead to one, but Justin Duchscherer and Bob Wickman pitched scoreless 8th and 9th innings and the Hitmen pulled out a 5-3 win to send the series back to Plainsfield. Aaron Harang threw 7 quality innings, allowing only 3 runs and 6 hits. Johan Santana went the distance in a losing cause, allowing only 5 hits and striking out 14 Plainsfield hitters. Plainsfield went to their young righthander in this do or die game. After a subpar and wild performance in the GLCS against Chuckanut Bay, Cain responded with a quality outing in what was Plainsfield’s biggest game of the year. Cain struck out nine Sunset hitters in 7 innings, while his counterpart from Montreal couldn’t get out of the 3rd inning. A 2-run homer by Jason Giambi erased an early 2-0 lead by Montreal, and 3 consecutive doubles by LaRoche, Posada and Griffey to open the 2nd led to 3 more Hitmen runs in the 2nd. Single runs in the 6th and 7th closed out the scoring, and Scott Proctor threw two scoreless innings to close out Game 6. 7-2 Hitmen, and the Series would move to a 7th and deciding game. With the momentum on the side of the Hitmen, the Sunsets were looking to break on top early in the series finale. Chipper Jones homered to start the scoring in the 2nd, and Michael Barrett added an RBI single to make it 2-0 after 2 innings. It remained that way until with 2 out in the bottom of the 4th, Jorge Posada tied the game with a 2-run homer. That seemed to spark the Hitmen offense, as Chase Utley added a 2-run homer of his own in the bottom of the 5th, which was followed by three more runs in the frame, including RBI singles for Holliday and Griffey. All of the sudden, it was 7-2 Plainsfield. Back to back triples by Utley and Wright opened the 6th, and Jermaine Dye added an RBI single to make it 9-2 Plainsfield. Hafner homered one final time in the 9th, but it was too little too late, as the Hitmen completed their impressive comeback in the series with a 9-3 win. John Smoltz took the loss, surrendering 6 earned runs in 4 innings. Chase Utley was 3 for 5 in the finale, to run his series totals to 14 for 30 with a homer and 3 RBI. A tremendous series for Travis Hafner (8 for 22, 4HR and 8RBI), thought it was not quite enough. JD Drew added 12 hits and 9 RBI in the 7 games as well for Montreal. Jorge Posada also had an impressive series for the Hitmen, going 6 for 18 with 2 HR and 7 RBI. A great series, and it was unfortunate that one team had to lose. These two teams were evenly matched, and it showed in the results all year and in the playoffs. Congratulations to Daniel Valois and the Montral Sunsets for a tremendous season. The draft begins in less than two weeks. Drafting is probably my favorite part of strat leagues, so I am looking forward to it. I am in a good position this year where I have enough starts and PAs going into the draft, so beside from maybe getting a reliever or two, I can draft with an eye on the future. Who will be this year's Jeremy Guthrie (7th round last year) be for me? 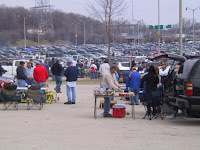 Opening Day 2008 -- What A Day! 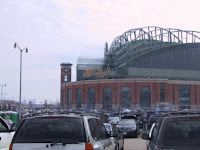 Courtesy of my beautiful and talented little sister, Kate, who just happens to be the executive assistant to the general counsel of a certain major league baseball team, my long-time friend Tim Heilman and I had the good fortune to attend opening day at Miller Park this year. For the both of us this was our 4th opening day. My first was many years ago when as a resident's assistant at UWM I helped organize a 300-person bus trip. The other two times were the final two seasons of County Stadium (additionally the final two last home games ... I have the brick and certificate to prove it). We had breakfast with my wife's sister and my daughter at a local restaurant and consequently got off to a late start for the stadium. We crossed over 94E to the 41S entrance lane at about 11:15. The line appeared quite long, so I settled back and took a few pictures on the way in like the one above. Surprisingly, the ride in did not take too long. Within about 15 minutes we were being directed to Preferred Parking (isn't my sister great?). Tim settled his SUV into our parking spot. We had arrived. What a day! Despite the evidence to the contrary (see the snow on the roof above), the weather was gorgeous. 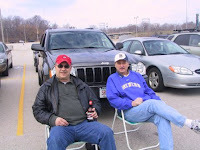 Jackets were eventually shed and chairs were placed strategically in front of Tim's SUV, away from the guys drunkenly tossing a football about. Beers were hoisted in salute to Kate and the Brewers and we sat back to enjoy the morning. Our next door neighbor offered to take our pictures. I'm the shaded (shady?) one on the left. Tim bought that Brewer jacket just the day before, wanting to be in high fashion for the game. There was just the barest hint of the remnants of winter in the air. Perfect for cooling off from all the activity we engaged in ... bringing beer and chips to mouth and being on alert for errant flying footballs. Soon enough the time came to ramble into the stadium. There was a buzz of excitement in the air. The Brewers are going to be a good team for a second consecutive year. When was the last time this could be said? 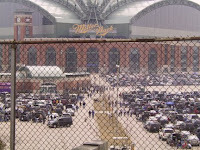 I could feel the energy as I entered the doors to Miller Park. We picked up our kitchen schedule magnet and Brewer towel and made our way to section 112. Our seats were in the infield boxes, about 30 rows up from the field (did I say how much I love my sister?) From here we could easily pick out some of the Brewers warming up ... Ryan Braun, Corey Hart, JJ Hardy, Jason Kendall and another whom we couldn't identify. I glanced around and made the acquaintance of the two fellas behind us, one who confessed that they had each downed ten Jaeger-bombs before entering the stadium, along with a few beers. Nothing in their demeanor caused any disbelief. 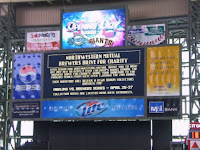 I checked out the scoreboard and was amused to see an advertisement for a charity drive being run by Northwestern Mutual in conjunction with the Brewers. My wife works for NML. The message reminded me she was home with our 15-month old. I could wax proudly of the sacrifice she made allowing me to attend while she stayed home, but I knew that she would be out shopping with the baby and her sister who had driven up from Chicago. And, our darling daughter, who is already cute beyond words, would have some new duds. This makes my wife happy. So I'm happy, too. No remorse there. The players lined up for the pre-game introductions. 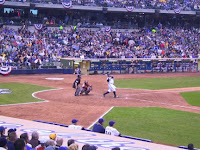 Prince Fielder and Ryan Braun received the biggest adulations, though the decibel level of the cheers for Hardy, Sheets and the others were not far behind. All this while we tried to contact Kate on Tim's cell phone. No luck. I knew that she wanted to join us for a while and no one had claimed the three seats to our right ... yet. Of course, that didn't mean they would be claimed. Heck, two years ago I was at a game with my wife and some friends of hers and we never made it into the park. The festivities outside were just fine. With Carlos Villanueva on the mound (I can't believe I traded him away in one of my fantasy leagues) the Giants went down meekly in the first. Villanueva looked sharp. He came out of spring training with the number four spot locked down after the release of Claudio Vargas. I was especially pleased because the number five starter is Manny Parra, a top lefty prospect. I drafted him pretty high in another league and had hoped he would make the team. 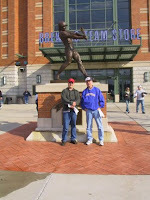 His last spring outing was shakey, but I read that manager Ned Yost did not let that outing sway his decision. He remarked it was probably rookie jitters. 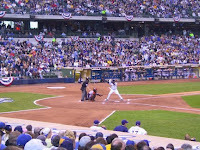 Rickie Weeks came to the plate to lead off amidst the din of 45,000 excited fans. He managed to draw a walk, which caused the fans to roar louder. With one out he stole second. 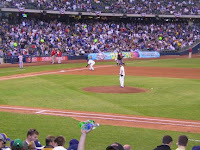 The fans were on their feet as The Prince Fielder strode to the plate. Wearing baggy pants and high socks, he looked like Babe Ruth. He waggled his bat menacingly waggled. With two strikes on him, Fielder showed why he has become more than just a power bat. He shortened his stroke and ripped a single up the middle. When Rickie came in to score the tremors from the noise in the stadium made the hairs on my arm stand on end. It was a truly electric. Bill Hall walked to the plate. Batting number 5 right behind Prince, it will be his job to offer some protection in the lineup for the big bopper. Last year was difficult for Hall. It's been written that he never really felt comfortable in centerfield and the team hopes a return to the infield will revitalize his bat. We didn't have to wait long. I don't remember what the count was. All I know is as the ball climbed higher and higher on its journey over the centerfield wall, the noise generated by the excited fans increased exponentially. A wave of camaraderie swept over the stands as the ball fell to earth just beyond the fence and the leaping effort by Aaron Rowand to spoil the fun. High-fives were exchanged with everyone in high-five proximity as though we'd been friends forwever. What a way to start the game! Kate came down in the third inning to join us (those seats remained empty). Opening Day fever made it hard to concentrate and the Brewer front office, being wise (at least wiser these days) allowed its staff to enjoy the day. She spent the rest of the game with us. We met a fellow who was juuuust a bit inebriated (he's behind me making the rabbit ears) and kept saying in a poor excuse for Scottish brogue, “Beam me up, Scotty.” When I pointed out that the person asking Scotty to beam him up would not likely speak with a Scottish accent, our new friend responded, “Aye.” It didn't matter. 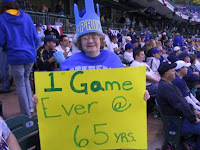 We also met Granny P. Granny was attending her first Brewers game and she had a sign to prove it. She was here with her granddaughter and was having a spectacular time. The fellas to her right kept her entertained. I think she had a few too, but couldn't swear. Who cares? We were all having fun. I returned to watching the game. A little while later I heard one of the guys start laughing and say that Granny P was standing on the Brewer dugout with five young ladies. No way. I turned around and saw that Granny was indeed gone. Then I looked over at the dugout. Oh my god, there she was! The Brewer staff who man the cameras that scan the crowd must have spotted her with her sign and decided she would be the perfect candidate for a game of The Price is Right, or whatever the game was called. 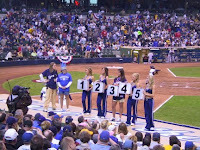 The five lovely young ladies held numbers in front with prizes behind the numbers. I don't know what the top prize was, but Granny made one selection (it was a $50 gift certificate) and quit. Smart lady. Gabe Kapler and Prince Fielder rapped out run-scoring singles in the bottom of the fifth to extend the lead. The announcer kept called Kapler, Gabe Kaplan, obviously confusing him with the former star of “Welcome Back Kotter” who has most recently been reincarnated as a professional poker player. We were laughing about the announcer's ineptitude when a roar rose from the crowd. I turned in time to see the ball disappear over the left field fence. Bill Hall had just stroked his second homerun of the game. I guess the question of whether his move back to the infield would help has been answered. We certainly appreciated his efforts and our cheering convinced him to come out for a wave. The rest of the game was spent trying to get action shots of Brewers at bat. Unfortunately, by this time the camera battery was losing its charge so I had to turn it off between shots, let it recharge a bit, then turn it on and take a quick shot. Some of the pictures were a bit fuzzy. Still, I got a few. Here is a picture of Prince belting a double off the right centerfield wall. This one just missed. I also tried to get a picture of the sausage race, but the battery was playing games at this time so I had to settle for this picture sent to me by Kate. Better than nothing. And you know, it almost seems a crime, but neither Tim nor I had a brat, sausage or even a hot dog on this glorious day. We did buy a couple Cousins subs though, before the game, and feasted on these in the parking lot afterward. 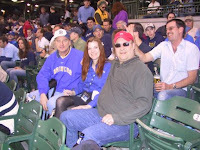 After the final out was made (final score 13-4), we lingered in the stands with Kate and waited for the crowd to thin. I gave Kate a hug. She took one step and this kid walking down the stairs came up and gave her a hug too. I looked at him and he smiled and said something to the effect of he thought he'd get in a quick hug too since they were being given out. I told him she was my sister and that he was dead meat. For a moment he looked concerned, but then I smiled and told him it was cool ... get oughta here. After all, weren't we all family ... at least for this day? We bade goodbye to Kate and went out to the parking lot. Before settling down to eat our subs, down a few beers and wait for the lot to empty a bit, we caught up with Brewer hall of famer Robin Yount for a picture. A great way to finish the day. Edited for some re-write because I'm picky and for a few spelling and grammar mistakes because, unlike what many members of the blogosphere think, the impression does matter. The Plainsfield Hitmen toppled the Chuckanut Bay Tubas by a 5 to 1 score at Yankee Stadium. In the bottom of the 2nd inning Plainsfield scored 4 runs when they had 4 base hits. That was all Mike Mussina (1-1) needed. Neither team managed to score after the 4th inning. Kevin Millwood (1-2) ended up with the loss. Despite losing, he struckout 12 Plainsfield batters in 7 innings. David Wright smacked 2 homeruns and had 4 RBI as the Plainsfield Hitmen defeated the Chuckanut Bay Tubas 11 to 6 at Yankee Stadium. Wright had a big evening at the plate. He blasted a two-run home run in the 4th inning and smashed a two-run homer (his 3rd of the postseason) in the 6th inning. Plainsfield totaled 10 hits on the night. The win went to Scott Proctor (1-0) who allowed no runs in 1 and 1/3 innings. John Maine (1-2) absorbed the loss. He served up 4 gopher balls in 3 and 1/3 innings. hits. After an out was recorded, Matt Holliday got things going when he laced a base-hit. One out later, Jorge Posada stepped in and he laced a one-base hit which scored a run. Posada took second on the throw. Ken Griffey Jr then doubled scoring the final run of the inning. For the game Plainsfield out-hit Chuckanut Bay 12 to 6. Bronson Arroyo (2-0) picked up the victory, allowing 2 runs in 8 innings. Brian Tallet (0-1) was charged with the loss in relief. He pitched 1 inning, allowing 4 hits and no walks. Center fielder Ken Griffey Jr touched them all and had 2 RBI as the Plainsfield Hitmen topped the Chuckanut Bay Tubas by a score of 12 to 7 at Busch Stadium. Dan Wheeler (2-2) came through for Kevin Kolb with an excellent relief stint. He performed flawlessly in relief in his 2 innings and recorded 4 strikeouts lowering his postseason ERA from 3.86 to 2.70. This was the kind of game that many fans love as the lead changed hands 5 times. The losing pitcher was Duaner Sanchez (0-1) in relief. He allowed 2 hits and no walks in 1 inning. The Hitmen absolutely jumped all over the Tubas pitching staff, hitting 10 homers in the four games. Kevin's offense was opportunistic and jumped on every miscue by the Chuckanut Bay defense. His team was clearly superior and he will be a fine representative for the Gold League in the BRASS Championship Series. Best of luck getting that 4th BRASS Championship, Kevin! This is a test post to see if everything is good with the invite. I really liked it when we had five AMs. I enjoyed reading minor league reports, prospect lists, etc. This year I will be drafting no AMs. Dont get me wrong. I like drafts too. In fact, drafts and player acquisition are my favorte parts of strat. But to me persoanlly it is sad we have reduced our amateur numbers. Below is a run down of how our crop of proposals fared this year. Kudos to BRASS voters for again carefully considering the proposals and voting, in most cases, in overwelming numbers one way or the other. Over the years I've always been impressed with how clear league preferences are on most topics and how smart voters have been in assessing the best and most fair season in which to implement changes also. This year is no exception. No matter what your position is on given topics, the league has always been so well served by its membership and how they approach these critical voting issues. Good work guys, as always. I've never been stuck with a klunker or impossible to implement or understand league change. The first Proposal, the one which synchronizes the in-season playing months with actual months, passed 21-2 (one abstention). So we will be trading now during in-season months right up to the last day of the month and then beginning play around the 7th of the following month, with a deadline for completion of games as the last day of the given month also. It seems clear that we've dug about as deep as the league cares to dig in terms of reducing the number of amateur players on rosters and increasing the draft's strength. While league voters narrowly approved (by a 13-11 margin) a further reduction in the number of amateur players we want to see on rosters, the league strongly favored retaining two amateurs (13 votes) over both the option of one amateur (5 votes) or zero amateurs (6 votes). As with last year, this change won't take effect until the 2009 Draft. So we all have about 13 months to cut down to a total of 2 amateurs on our 2009-10 pre-draft rosters. 71% to 29% of the membership (17 yes to 7 no) voted to make another in our series of routine, cosmetic modifications to BRASS dollar amounts to make them feel just about like modern MLB salary numbers. The proposal also slightly modified the Y1, Y2, and Y3 contract amounts to bring them more closely in line with MLB entry wages and account for the salary increases that MLB players get as their early service time accrues (BRASS had a flat rate for each season with no raises). The new dollar amounts will be shown in the next roster file update, which will come out after the April 18 trade freeze begins. The new system will officially be in effect at that time. 23 of us liked the proposal that modified our player overuse fines to a graduated scale whose penalty amounts varied in direct proportion to the size of the infraction. The usage buffer concept is retained in this proposal, preserving the buffers that currently exist to cover slight manager miscalculation and other events. We definitely thought overuse fines should still exist, but that the fine should better fit the crime that our current system. By a 14-10 margin, the league said they prefer to keep the Home/Road Discrepancy program in place as is, measuring and rewarding as it does now.23 of us also stated that we believe players who are on no-trade contracts may not be exposed to selection in The Draft and must remain on a team's protected list from here forward. 17 of the 24 of us want to see veteran players get veteran player (or "U") contracts when selected in the draft. We'll begin this with the 2008 Draft.12 people felt the current Y1 PA and IP thresholds were best and 12 wanted to see them revised slightly, as detailed in the proposal. So these thresholds will stay as they are. By a 14-10 margin, league voters did not wish to see draftees become eligible for a month-to-month contract, irrespective of their MLB PA or IP levels. These contracts (MTM) therefore remain in the private domain of Secondary Free Agency signees. By an 88% to 12% (21 to 3) margin, the league approved the utilization of the "B" contract minimums and not the "U" contract minimums to determine contract amounts for players re-signed after returning to their teams when no one signed them in the Free Agency process. And in what is certainly the ballot item with the biggest impact on league play of any proposal on this list, the question of whether to eliminate the DH (and if so, when), the league voted decisively but not overwelmingly, 58% to 42% (14-10), to eliminate the DH from BRASS in the future. The 2010-11 season was selected by 13 voters as the year in which this will be implemented. The 2009-10 season was the choice of 9 voters. 2 voters wanted the DH to be gone immediately, starting with next season. So we will all have until September 1, 2010, exactly 30 months from today, to figure out how best to plan our individual roster set up for the elimination of the DH. While I would bet the league membership is savvy enough to have done it in 3 months if they needed to, we'll have 10 times that transition period, so we will have plenty of time to make plans or discuss/vote on any special circumstances that we perceive may be part of this implementation. I encourage you all to give some individual thought about how this change will impact your roster and while it almost sounds silly to consider how something 30 months away will impact you, time passes and things can catch up to us all. Someone like me, who has extended DH David Ortiz's contract for three seasons, will have some decisions to make before that last season comes due for me when Big Papi may not have a position on my roster anymore, other than pinch hitter.Again - great work here guys. Nothing we can't handle and implement cleanly on this list. Nothing scares me at all here from an administrative standpoint. And from the decisive voting totals here on the topics we all liked, it certainly looks like we all decided to tweak the league in small ways to make it more fun or more to our liking, which is the point of the process. I'll revise the constitution as I am able, as usual, to reflect our changes and get the new document out to you all. Good luck with your draft prep! I would just like to add my 2 cents about the recent posts on rule changes. I agree with most of what has been written so far. In particular, I see no reason for tripling the salary scale. I was sitting on the fence on this, but you guys convinced me (I will have to change my submiottedvote): we're used to this scale, and it doesn't matter whether we have a $500 or $35M stipend to play with, what counts is player/value, no matter what the baseline is. Plus, I can't remember the details (what is Scott who wrote about that a few years back? ), but I'm not sure straightforward tripling of everything doesn't create some discrepancies somewhere down the line. As for the amateur players ratio, I personally love the draft, and scouting those is my favorite part. But I understand the league's concerns, and will vote for abolishing them altogether (might as well do it all the way if we're going to do it). It would actually be interesting to see more people comment on their team's nicknames. I'm sure some of them have interesting stories behind them. Here are mine. The first two are kind of boring, the last one is more interesting. BRASSWORLD: Lafontaine Park Diamonds. I live right next to Lafontaine Park in Montreal, and its baseball diamonds (in ever dwindling numbers now) were where I had my best years playing organized baseball between the ages of 10 and 15. BLOC: Parc Jarry Expos. The Expos were (and will always be) my favorite sports team of all-time. Damn you MLB. Your loss. Parc Jarry was the home of the Expos from 1969 to 1976, before they moved to then state-of-the-art Olympic Stadium. It was a small place (max. capacity of just under 30, 000), but it was a fantastic place to watch baseball. You could almost touch the players on the field, and the ambiance was crazy. People just loved their Expos. The first year, the Expos were one of the very few teams to draw over a million fans (at a time when one million was a lot) to their games. I have so many fond memories from that place. The "Parc Jarry" moniker is of course aimed at reflecting the French part of Montreal’s bilingual culture. BRASS: Montreal Sunsets. Well, Montreal is my hometown, I was born right downtown, baptised at what later became the Université du Québec à Montréal, and lived there all my life except for a 10-year hiatus in Toronto, Ottawa, Vancouver, and Los Angeles. "Sunsets" stands for two things: first it's an homage to my alma mater, UCLA, where I got my PhD in, ahum, 1991. Our department (Linguistics) was just off Sunset Boulevard. I just loved my time there. The logo's colours are UCLA's. Benoît Gauthier, a fellow Montrealer who was then a member of Brass, designed it (as well as a few others in the league). Second, it's a reference to a unique set of events that happened a few times at the old Expos home of Jarry Park, before league officials decided to delay the start of some early evening games. Jarry Park was a small Junior League stadium, with one set of bleachers in left field. Early in the 1969 inaugural season, the team had scheduled a bunch of 7pm games. That worked for a while. The problems started when the days got longer and the sun would start to set after game time from higher up in the sky. It so happened that those sunsets were right behind the left field beachers, which after a while were no longer shielding the infield from the glaring sun. That’s when "infield ground-rule doubles" started to happen. The chain of events would go like this: batter grounds out to shortstop, shortstop handles the ball cleanly, throws over to first base perfectly, and … first-baseman loses the ball in the sun ! Nobody touched the ball after the throw, both the fielding and throwing part of the play were flawless, and the batter ends up at second base. Official scoring: ground-rule double. After firstbaseman Ron Fairly complained a few times that every groundball to shortstop Bobby Wine was life threatening, game umpires decided to delay the game once the sun would competely set behing that problematic spot. And if you think this is funny, ask someone to tell you the Joe Sparma story! If you read my earlier post, you know I like this one. I'm for phasing out AM players completely, and the logical next step in that process is to reduce the number to either 1 or 2 next year (having gone from 5 to 3 this year). As others have noted, the lack of impact players in the rookie draft pool really draws out the process of turning around a bad team. Plus, the most astute managers tend to also be the best at picking AMs, so dynasty teams tend to get reinforced. I've been through at least two of these now, and I'd really, really like it if I didn't have to do it again. (I'm talking about rescalings, not a restructuring like when we went to the Y1-Y2-Y3 system.) I really don't care whether our salary structure comes anywhere near matching that of Major League Baseball; that target will never sit still anyway. I want a system that's easy to use and understand, and which balances the different types of costs in a way that makes sense. Multiplying everything by 3 isn't going to make the system easier for anyone. Not that most of us will have trouble remembering to adjust the numbers before comparing contracts across different years, but it's one more thing to worry about. Just as with previous updates, it's not just a matter of multiplying everything by a fixed number. If this proposal passes, AM, M0 and Y1 contracts will be cheaper (relative to the revenue stream) than they are now, while Y3 contracts will be more expensive. Should we make those changes? I don't know, but if we do, we should do so explicitly, not as a side effect of/footnote to a general round of inflation. A very good idea, and long overdue; frankly, it's ridiculous to charge the same amount for a ticky-tack foul as for using, say, Barry Bonds full time. I'd like to see the ranges widened somewhat, and/or based on percentages of a player's allotted usage instead of fixed PA/IP amounts. But the proposal before us is certainly better than what we're doing now. This is a no-brainer for me; I actually thought we already required this. The only change I'd make is to allow NT players to be left unprotected as long as the owning team pays the NT cost if the player is claimed by another team. The problem with this is that it's not always obvious which players are affected. Sure, if the guy had 200 AB the year before, you'll probably know about it. But suppose he pitched 50 innings in 2002, then had a couple of Tommy John surgeries before finally getting back to the majors last year. And suppose you didn't really start paying attention to baseball until 2003. It's going to be an unpleasant surprise when you draft him, then learn that you can't sign him to a Y1 contract. The nice thing about the present system is that all players in the draft pool are treated equally, regardless of their history. I'd like to keep it that way. We always had this option (at least once MTM contracts were introduced in the first place) until the overhaul of the contract system. I don't know if the MTM option was removed deliberately or if that was an oversight, but I see no reason for the removal. The MTM contract is the ideal vehicle for a player who doesn't have enough PA/IP to keep on the roster the whole year, and doesn't figure to have any future in MLB. Why shouldn't you be able to use it on a draftee? Where did the name Chuckanut Bay Tubas come from? So, why the Chuckanut Bay Tubas? Good question. The answer is that I wanted to pay homage to the early portion of my undergraduate studies. Coming out of high school, I was a really good tuba player. Believe it or not, when played properly the tuba can be quite a beautiful solo instrument, with more range than any other brass instrument. I decided to go to Western Washington University to pursue my undergraduate degree in music performance (never mind the fact that after two years I switched to physics, that's a whole 'nother story). So, Western Washington University is located in beautiful Bellingham, Washington. I thought about naming the team the Bellingham Tubas, but that didn't quite do it for me. So then I thought about Bellingham Bay Tubas, as Bellingham Bay (part of the Puget Sound) is quite beautiful to look at. However, that name really didn't quite work for me either. Just south of Bellingham Bay is Chuckanut Bay, which is a great place to canoe or kayak. Chuckanut Bay Tubas had a nice ring to it, so a new franchise name was born! RRBL: Madison Warthogs - went to grad school at the University of Wisconsin-Madison, have some warthog slippers. NASA: Renton Microbrews - grew up in Renton, Washington and I love beer. BLOC: Redwood City Atom Smashers - currently live in Redwood City, California and part of my current job is to collide protons into other atoms to make radioisotopes. BRASSWORLD: Palo Alto Robber Barons - an homage to my employer's location and the mascot that the student body wanted when Stanford University decided that Indians was no longer a politically correct mascot. The Diamond Gems defeated the Chuckanut Bay Tubas by a score of 7 to 4 at Coors Field. Diamond had 4 runs cross the plate in the bottom of the 6th inning when they had 5 base hits. The key offensive moment was provided by Alfonso Soriano who made the Diamond fans a happy lot when he doubled bringing in two baserunners. Diamond out-hit Chuckanut Bay for the game, 13 hits to 5. Pat Neshek (1-0) got credit for the victory, pitching 1 inning and allowing no runs. J.J. Putz recorded the save, his 1st. The losing pitcher was Livan Hernandez (0-2). He was hit hard and gave up 9 hits and 2 walks in 5 innings. Kevin Millwood went 8 strong innings as the Chuckanut Bay Tubas defeated the Diamond Gems by the score of 2 to 1 at Coors Field. Chuckanut Bay took the lead for good in the 3rd inning plating an isolated run utilizing 2 base hits. Chuckanut Bay had only 6 hits for the night. The victory was credited to Millwood (1-1) who went 8 innings, allowing no runs. Takashi Saito earned his 2nd save. Josh Johnson (0-1) took the loss. In a lop-sided win the Diamond Gems ripped the Chuckanut Bay Tubas by a 7 to 1 count. Scott Rolen had a good evening at the plate. He doubled bringing in two baserunners in the 1st inning and bombed a two-run dinger (his 1st of the post-season) in the 3rd inning. For the game Diamond out-hit Chuckanut Bay 12 to 5. Chien-Ming Wang (1-0) picked up the victory, allowing 1 run in 5 innings. Livan Hernandez (0-3) absorbed the loss. He allowed 10 hits and 5 walks in 5 innings. The Chuckanut Bay Tubas had very little trouble at Coors Field downing the Diamond Gems. The score was 9 to 2. Chuckanut Bay came up with 5 runs in the top of the 2nd inning when they had 4 base hits. The early run support proved sufficient for Paul Byrd (2-0) and Chuckanut Bay. That was all the run support Byrd required. Chuckanut Bay had 8 hits for the night. Josh Johnson (0-2) was given the loss. He allowed 5 runs and 4 hits in 1 and 2/3 innings. runs on 1 hit. The early run support proved sufficient for Hernandez and Chuckanut Bay. That was all the run support Hernandez required. Chuckanut Bay had a total of 8 hits for the game. Chris Capuano (1-1) absorbed the loss. Chuckanut Bay scored big getting 4 runs off him in 2 and 1/3 innings. This series was one in which one team got a lot of luck and as a result won the game. Both teams scored 39 runs in the series, showing how even the matchup really was despite some lopsided scores. Game 7 really could have gone either way, but I seemed to get good luck in the form of home run splits and Vaughn was getting bad luck in the form of two errors by a 2e6 shortstop, hitting into a lineout DP to kill an early rally, KRod giving up two bases-loaded walks, etc. Honestly, if these teams played another 20 games, I bet Diamond wins around 14 out of 20. I just happened to catch a couple of breaks. Chuckanut Bay looks forward to matching up with Green Bay or Plainsfield in the next round.